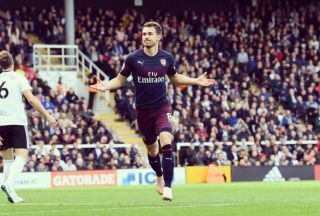 Arsenal have reportedly formally informed Aaron Ramsey that he will not receive a new contract and will therefore be allowed to leave on a free transfer next summer. The 27-year-old will see his current deal expire at the end of the season, and as the months have gone on without an agreement over a renewal, it has looked more and more likely that he’ll move on. Given his importance to the Gunners over the years and the role that he is playing for Unai Emery this season, it seems like a questionable decision, but it’s now claimed that the club have formally told the Welshman in a face-to-face meeting that he will not receive a new contract offer, as reported by The Daily Mail. It’s added that Man Utd, Chelsea, Juventus and Bayern are among the clubs interested in signing the midfield ace, and they will certainly be buoyed by this latest update as it seems to consign Ramsey to an exit while the Mail note that a January departure is unlikely. Both United and Chelsea could certainly do with midfield reinforcements, particularly the latter as Maurizio Sarri will see Mateo Kovacic return to Real Madrid at the end of the season when his loan spell ends. A January exit would seemingly make most sense from an Arsenal perspective in order to avoid losing him for nothing, but that doesn’t seem to be the likely outcome which will surely be a disappointment for many supporters given what Ramsey has done for, and achieved with, the club over the last 10 years. Meanwhile, Emery was full of praise for him when discussing how he has reacted to the situation, with Ramsey evidently eager to sign out on a positive note and is focused on delivering success to Arsenal in his final season at the Emirates.